Once in awhile, we ALL have a stressful day. But being able to come home and unwind in a hot tub cannot be beat! Having the hot water bubbling over you allows the troubles of the day to float away. Many times, while enjoying this excellent escape from your stresses, it is easy to forget the importance of your new hot tub’s maintenance. When serious things go wrong with your hot tub, like tripped breakers, a malfunctioning pump, heater failure and other things, of course you would call a professional. However, you need to do your part in maintenance as well. If you do not properly take care of your spa’s system, you can have a buildup of things like cloudy green water, white scale deposits, and brown water – all of which can cause irritation of the eyes or a strange smell. This is not only annoying but can make family members and friends want to avoid using your new tub! An easy maintenance step for you that will keep your system in excellent condition, is draining the tub once every three months and keeping the water balanced with the proper chemicals. This spa care tip will help you keep clear, nice smelling water in your tub for you to enjoy! Soft Soak Trio® by BioGuard®, is a hot tub water chemical which keeps your hot tub water clean and clear without the smell of chlorine. Gentle and soft, Soft Soak Trio® adds to the overall comfort of your hot tub. This provides an easy way to maintain your hot tub and allow you to have control over the condition of your spa water. Since the product comes in a pre-measured packet, there is no worry regarding how much to add to maintain appropriate hot tub care. This provides not only clear sparkling water but clean, healthy water as well. This gives the assurance that the chemistry of your system is balanced and you can experience complete stress-free relaxation. SpaGuard® BioGuard® spa product line of chemicals are premium hot tub chemicals we stock which remove the contaminants that cause green water, scale deposits, cloudy water, and other irritating water problems. These product offer a trio of reasons why you should use these products to maintain proper hot tub care. We offer: Trio is Simple, Trio is Soft and Trio is Clear. This covers any and all problems you may encounter with everyday use of your spa. Hot Spring® offers a series of four product lines: Highlife NXT®, Highlife®, Limelight®, and Hot Spot®. Hot Spring’s philosophy is, “We design spas based on how you will actually use them. The Comfort Control® System lets you customize the strength of massage. The SmartJet® System allows you to direct power to the jets you are using, instead of powering all of the jets at once. The Hot Spring® Spas are definitely the Cadillac of spas. Built with layers of foam insulation and depending on the model, they offer full-color LCD display screens, advanced control systems, multi-color and zone lighting, various jets for different parts of your body, wireless entertainment systems, and many more features designed for luxurious comfort. 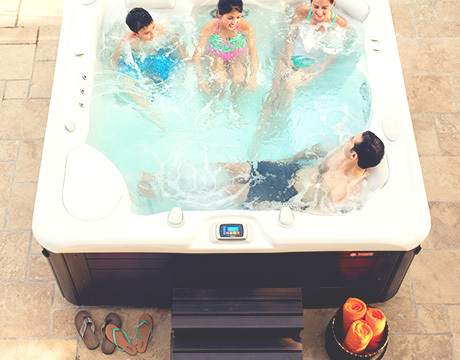 Caldera® Spas offer three different product lines: Vacanza®, Paradise®, and Utopia®. In each model, you will find FiberCor® Technology, which offers an extra strong spa insulation combined with an all-climate cabinetry and an Advent™ control panel. This incredible combination allows you to not only have the best in comfort but complete water temperature control and hot tub safety as well. Caldera® hot tubs offer seating for 2 to 8 people, which makes it possible to purchase the exact size you need. Freeflow® offers a total of six different models, and all of which can be easily plugged into an 110V outlet! They are designed to seat two, three, four, five, six, and seven people. This versatility allows you to choose a specific size that will fit your requirements. Depending on your choice, you can have a serene waterfall, an LED underwater light, and even specific jets to target your areas of pain and tension. Freeflow® hot tubs have a unique manufacturing process which features a unibody (one-piece) shell. This process does not require internal support, is lightweight, and has a rotational mold which requires fewer materials than a regular acrylic tub. As a result, Freeflow® hot tubs are incredibly affordable! Hot tubs can be great for the entire family! However, as with any body of water, it is essential that you observe hot tub safety. This includes keeping the area around the tub dry to avoid any slips and falls as well as keeping the cover on when it’s not in use and making sure child safety rules are observed. Unsupervised, a child can enter the tub without an adult present. A child may accidentally increase the temperature of your hot tub to the dangerous point, they could hit their head and pass out, or other tragedies that can put their life in danger. Overall, this makes it critical to take all of the precautions possible when it comes to hot tub safety. Many people do not realize how dangerous increasing the water temperature in a hot tub above normal can be. High temperatures in hot water systems, when above normal, can cause drowsiness, which can lead to unconsciousness and as a result – drowning. The temperature in your hot tub should never exceed 104°F. The temperature considered safe for an adult is about 100°F. People taking medications with a side effect of drowsiness should not use a hot tub alone as they can fall asleep and slip underwater. People with medical problems including heart disease and diabetes should consult with their doctor prior to using hot tubs. Always keep a secure cover on the tub when not in use. This will help deter a child from trying to enter the tub unsupervised. When going on vacation, make sure to disconnect the electric cord before heading out the door. This will help to avoid any problems such as an electrical short. A spa system is a wonderful way to enjoy luxury and relaxation in warm, bubbling waters. Whether you are in an apartment with a small balcony or a homeowner with a large backyard, it is possible to find a hot tub to fulfill your unique needs. With the large choice of models available here at Seven Seas Pools and Spas, you have the opportunity to choose one that will fit both your needs and your pocketbook. By keeping it clean and observing spa safety, you can enjoy your system for many years to come!